Report: Many weapons used by Mexican drug gangs originate in U.S.
A new report says that more than 70% of firearms submitted to the ATF from Mexico for tracing originated in the U.S.
(CNN) -- A trio of Democratic U.S. senators called for tougher firearms laws and regulations after releasing a report that showed a large number of weapons used by Mexico drug gangs originate north of the border. More than 70% of 29,284 firearms submitted to the U.S. Department of Alcohol, Tobacco, Firearms and Explosives for tracing by the Mexican government during 2009 and 2010 originated in the United States, according to the report. The report, released Monday, is the latest element in a debate over how large a role the United States plays in arming the ruthless Mexican drug cartels that are responsible for more than 34,000 killings since 2006. Proponents of stricter gun controls say that the staggering numbers of U.S. weapons that end up in Mexico show that something must be done to control arms smuggling. But others say that the numbers are skewed, arguing that Mexico asks the ATF to trace only weapons that it believes are from the United States. "Congress has been virtually moribund while powerful Mexican drug trafficking organizations continue to gain unfettered access to military-style firearms coming from the United States," said Sen. Dianne Feinstein, a California Democrat. Are drug cartels considered terrorists? Is Calderon's drug war working? Feinstein was joined in her call by Sens. Charles Schumer, D-New York, and Sheldon Whitehouse, D-Rhode Island. In a letter this month to Feinstein, the ATF acknowledged that the United States keeps no record of criminal firearms seized in Mexico and that "the Mexican government does not submit every recovered firearm to ATF for tracing." As a result, the ATF-provided figures may not be representative of all firearms recovered by Mexican officials. "This report confirms what many of us already know to be true. ... It is still too easy for Mexican drug lords to get their hands on deadly military-grade weapons within our borders," Schumer said. "We need to redouble our efforts to keep violent firearms out of the hands of these traffickers." The senators are calling for reinstatement of an assault weapons ban that expired in 2004 and better enforcement of a ban on the import of military-style weapons. They also want to close a provision that allows private sellers at gun shows to sell weapons without a background check. "This report outlines common sense measures that will help protect our border and our communities by keeping dangerous weapons out of the hands of Mexican gangs and drug cartels," Whitehouse said. Violence associated with drug cartels has been a growing problem in Mexico, resulting in thousands of deaths and arrests for corruption throughout law enforcement. "We're seeing large-scale violence that we didn't see 20 years ago," Andrew Selee, director of the Mexico Institute at the Woodrow Wilson Center for International Scholars in Washington, said in May. Mexico has been critical of what it sees as lax U.S. efforts at blocking guns from ending up in the wrong hands. "It is clear that the availability of high-powered guns in the United States for Mexican criminals is hurting bilateral security," Mexican National Security spokesman Alejandro Poire told CNN in February. "We would hope to see an overwhelming response from the United States government to prevent these guns from getting into Mexico." In a 2010 speech to the U.S. Congress, Mexican President Felipe Calderon called for action similar to what the U.S. senators propose. "If you don't regulate the sale of arms in the right way, nothing guarantees that the criminals won't have access to these," Calderon said. "There are more than 7,000 gun stores along the border with Mexico where anyone can buy. I ask Congress to help us and understand how important it is to have strong laws to avoid arming the criminals." 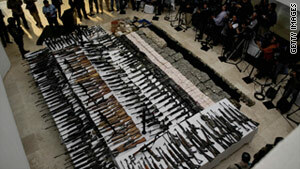 Calderon put the number of weapons from the United States even higher, at 80% of all assault weapons seized in Mexico. The ATF is also under fire for allegations that it allowed known and suspected gun smugglers to purchase hundreds of weapons in the hope that they could be traced to their ultimate destination, believed to be border region crime syndicates. Sen. Charles Grassley, an Iowa Republican, has said that under the operation, ATF lost track of hundreds of those guns. The allegation the ATF knowingly allowed the sale of assault weapons to a straw purchaser who then transported them into Mexico is "false," according to Assistant Attorney General Ronald Welch. Despite the criticisms, the United States has not been inactive on the arms smuggling issue. In February, 17 people were indicted in Arizona in five separate cases of illegal trafficking of arms that were destined for Mexico. Operation "Too Hot to Handle," as it was known, involved about 300 weapons -- mostly assault rifles and automatic pistols -- that were seized in Arizona, Texas and Mexico. It involved the use of "straw purchasers" to buy and then transfer the guns to the criminal groups. The operation "revealed the lengths that criminal organizations will go to in illegally procuring weapons for Mexican drug cartels," Immigration and Customs Enforcement Special Agent Matt Allen said at the time.